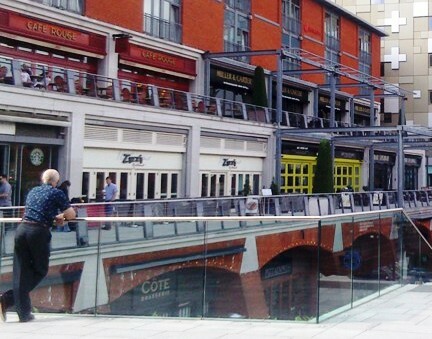 At the heart of Birmingham is one of the most popular and chic venues to hang out - The Mailbox. The frontage is a striking pillarbox red, while the rear overlooks the canal with al fresco dining and an ambience of calm. Packed with restaurants, bars, designer shops, hairdressers and Mal Maison hotel, the Mailbox has become a haunt for celebrities such as Kylie Minogue during their visits to the city. The BBC studios and offices in the West Midlands are also based in The Mailbox. 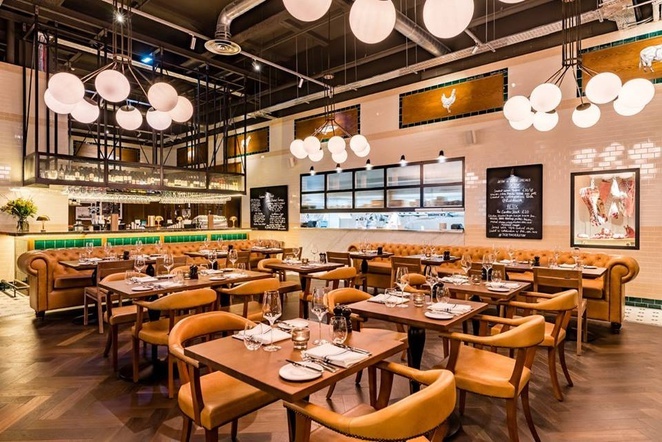 The first UK Tom's Kitchen outside London, this stylish brasserie from chef Tom Aiken offers excellent food and large portions for fair prices - from around £40 for a three course meal per person. Aikens has created a collection of menus which are then brought to life on a daily basis by Head Chef Tom Wells & his team. Dishes like steak, gourmet stacked burgers, scallops with black pudding, spicy crab cakes, chicken schnitzel and the highlight of the menu - a heavenly chocolate and peanut butter fondant. They may be well loved favourites but they have been elevated to a higher level. Added to that is good service by staff who are well versed in the menu and making recommendations. Airy and chic with Victorian style tiles around a statement bar, the restaurant also serves up a selection of mean cocktails and has welcoming wooden booths to relax in with a drink while waiting for a table or letting off steam at the end of the day. Tom's Kitchen is a class above most restaurants in the Mailbox. It's a must visit. Chic and sophisticated, diners can eat at Bar Epernay to a soundtrack of live piano music. There is a long curved champagne and cocktail bar to one side with a circular seating area (around a cosy fire in the winter), while the rest of the room is for diners. Food is traditional with a French influence, such as baked camembert cheese with crusty bread to share as a starter. It offers good quality food at a reasonable price in elegant, sophisticated surroundings. Specials change regularly and include deals, such as a two course lunch from Monday to Saturday for £10 or a two course dinner from Monday to Thursday for £15. 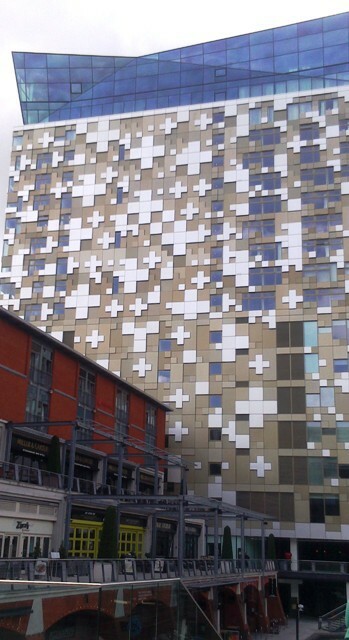 Although, this is actually classed as being in The Cube (the neighbouring building to the rear), this popular restaurant overlooks The Mailbox from its towering position. Renowned chef Marco Pierre White has put together a traditional menu for the restaurant that specialises in steaks, but there are plenty of other fish and meat options too. The location is one of the prime reasons for visiting this restaurant as it has a 360 degree view of the city from the top floor of The Cube. Floor to ceiling glass windows and a terrace bar make the most of this position too. It is particularly beautiful at night when the city lights up. It has become popular for special occasion meals, especially as it has a stylish champagne bar in one corner. Starters are £5.75 - £8.50; steaks are £24 - £28; fish (eg. salmon fishcakes, halibut steak and creamed potatoes etc) £13.50 - £19.50; and puddings £6.25. Examples of other dishes are: chicken kiev with slow roasted tomato, real chips in beef dripping and garlic butter sauce for £16.95; roast rump of lamb, à la dijonnaise with pomme dauphinoise for £17.75; and steak and 'The Governor' pie for £14.00. A word of advice - the entrance to this restaurant is a little hidden. Diners use the lift in the Hotel Indigo reception in The Cube, as this eatery is located on the hotel's twenty-fifth floor. If you have reservations for busy periods, such as a Friday or Saturday, allow yourselves extra time as a queue can form for the lift. Part of a chain of French restaurants, there are plenty of mouth-watering dishes including steak frites, moules marinières, oven-baked camembert, mackerel pate and creme brulee. 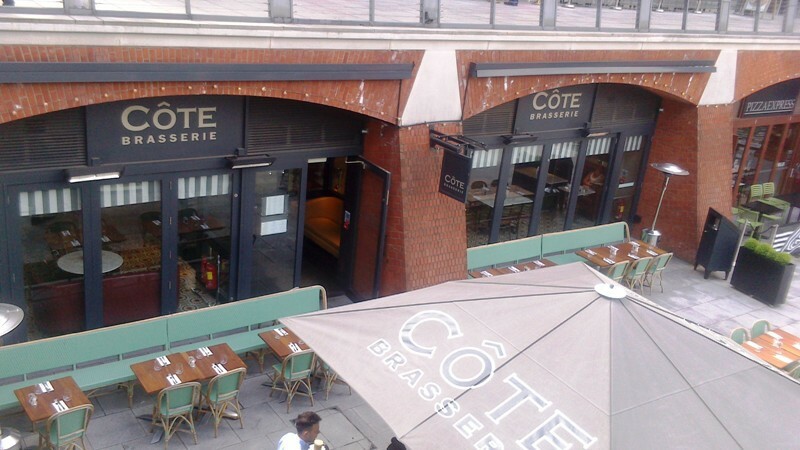 It is traditional French food in a smart-casual setting. There are often special deals on offer, such as £9.95 for a two course weekday lunch, which may explain why Cote won the Good Food Guide award for Best Value Restaurant in the UK for 2009. Average prices range from £5.50 to £7.00 each for a starter; £9.50 to £14.00 for a main meal (£16.50 for a steak); and £4.00 to £6.00 for a dessert. The menu changes regularly to refresh the options available. It's worth noting that diners currently get two hours free parking at the Mailbox car park (which is pretty expensive). It's location at the Mailbox is right at the side of the canal basin. Lovely in summer when the outside tables are often full. Bar Estilo is a Spanish tapas bar that reopened after renovation works in mid 2013. 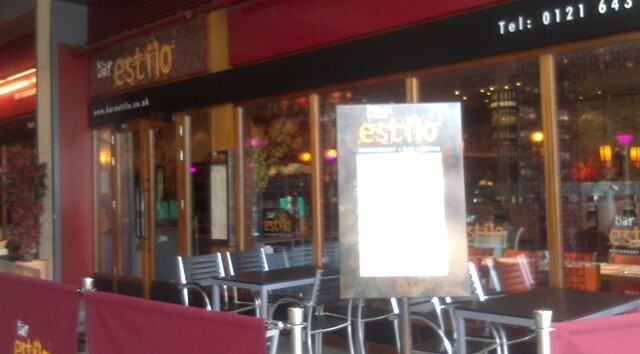 Bar Estillo has an intimate, laidback feel and often requires a reservation for evenings from Thursday to Saturday - not having one often results in an hour wait for a table. There is a huge range of Mediterranean food on offer, and lunchtime specials and set menus too. An example of a set meal for a minimum of eight people costs £20 per person and includes: basket of bread with alioli and olives, nachos, calamari with alioli, meatballs in tomato sauce, spicy chicken wings, seafood paella with chicken and chorizo, BBQ ribs with sweet chili glaze, chorizo in red wine, goats cheese and chili mushrooms, spiced hummus with pitta bread, lamb kofta with tzatziki, tuna melt quesadilla, prawn and mango salad, and fries. It has a vibrant atmosphere that attracts young professionals. Stunning views and Asian fine food, The Oriental is a stylish restaurant. Tantalising fine food from Malaysia, Thailand and China provide an Oriental fanfare for diners in sumptuous surroundings in this restaurant with panoramic views of the canal. Dishes include tom yam soup, green Thai curry and nasi goreng. Set menus start from £21.50 per person. Quality Italian food from this renowned restaurant chain. Located inside the Mailbox on the top floor, it is opposite the entrance to the BBC. It has good Italian produce at average prices. Starters such as buffalo mozarella with rippened tomatoes and avocado start from £4.25; main meals are between £8 and £15, from pasta dishes and risotto to larger meals such as chicken Milanese style in breadcrumbs with tomato and basil sauce and roasted potatoes. This boutique hotel attracts celebrities for its rooms and food in the restaurant at the foot of The Mailbox. A lavish bar and dining room on the first floor has a cosy, chic atmosphere and is particularly busy from Thursdays to Sunday night, when reservations are recommended. It is slightly more expensive than average but the brasserie offers sophisticated twists on the norm. Starters are priced between £5 and £9 and include dishes such as English farm asparagus, mushroom Scotch egg and sauce gribiche. Most main meals are priced from £13 to £20, but high end options are available, including lobster (£28 for a half, £48 whole), or lobster and fillet steak for £39. It's a decadent dinner location, and visiting politicians, actors and singers can regularly be seen in the restaurant. This American-style steakhouse is chic with large plates of delicious, uncomplicated food and a lively atmosphere. Situated on the balcony level at the rear of the Mailbox, overlooking the canal, Birmingham Miller and Carter focuses heavily on steaks and burgers - there are eight different types of steak on the menu. The eatery also has a few fish and pasta dishes on the menu, but beef is its main attraction. Asian-inspired dishes and traditional favourites are on offer at this casual restaurant overlooking the canal. Typical dishes range from sesame crusted salmon to a Mexican burrito or pizzas and pastas.